Today and Friday, I’ll review some Haribo gummies that I bought while in Switzerland. 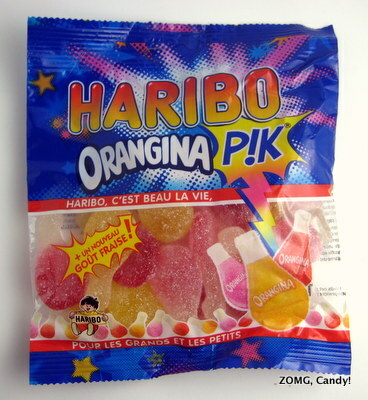 First up is Orangina P!k. I know Orangina is a fizzy orange drink that’s available in Europe. No idea what the P!k means (and why it’s not a Pik). Haribo, of course, is a candy brand that is found all over Europe and the US. 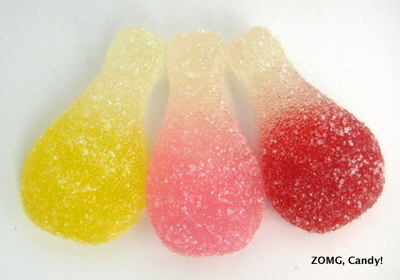 At any rate, it’s pretty clear that these are supposed to be gummified soda bottles, though I think they also look like chicken drumsticks when turned to the side. They came in yellow, pink, and red (no orange, despite the name!). 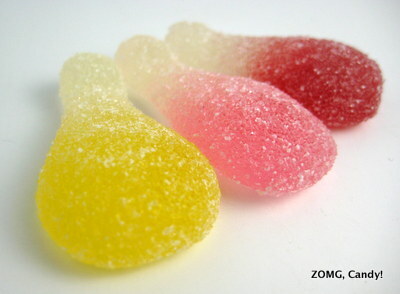 The gummies were covered in sour sugar and had a wonderfully firm, sproingy chew. Red was tart to start from the sour sugar, then sweetly fruity. If I had to guess, I’d say it was a mild cherry or fruit punch flavor. Pink was strawberry, maybe? Again, sweetly fruity, but with more floral notes that played off the tartness. Yellow was citrusy. The color suggested yellow, but the flavor was mellow with no acidity or pithiness, so I think it was the classic orange flavor of Orangina. I loved the strong fruity flavors and bouncy texture of these guys. They were just the right amount of tart. I wish I’d bought an additional bag, or three. OMG.